By sheer cosmic fluke, one the most prolific developers in the Atari Jaguar homebrew scene (yes, it’s a niche of a niche of a niche) lives in Adelaide, which allows convenient access to viewing works in progress. As luck would have it, we were able to check out their latest game over the last week, and it’s going to be welcome news for retro game fans who enjoy updated classics adapted to consoles that are, in their own right, considered retro in 2016. The beta of Reboot’s game Rebooteroids got a good workout and it’s looking almost ready for launch. Leading up to it’s release, Reboot have uploaded the ROM for the public to test. Although both the Jaguar and its flash carts are rarer than hens teeth, if you don’t own either you can download Virtual Jaguar and give it a go before its cartridge release. It’s a very polished homebrew game in its current state. 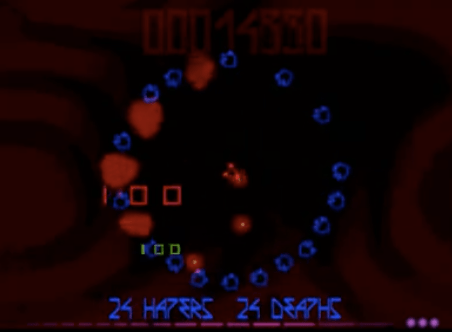 There are two main gameplay choices; Skirmish is an update of old school asteroids, plus there’s the main gameplay mode with diverse patterns of enemy rocks for each level. In addition to these and various multiplayer options, you can scan game-generated QR codes and upload your score to an online scoreboard. Go to this thread on atariage.com to find out more and download the latest ROM. We’ll upload a video of it to our Facebook page shortly. It’s an exciting time for fans of Atari’s much maligned final console – Xenon 2 (also from Reboot) will also be released soon. More news as it comes to hand. SNK is a renowned brand when it comes to fighting games – especially with classic franchises like Samurai Showdown, Fatal Fury and King of Fighters – with the latter two being part of the same universe. In 1999 SNK also released a lesser-known but well made fighting game called Garou: Mark of the Wolves which came out originally in the arcades, and was followed by releases on Neo Geo AES, Dreamcast, etc. The game is identical to King of Fighters in the sense that it includes a familiar roster of characters, unique battle techniques and lush graphics for a 2D fighter which pushed the Neo Geo hardware capabilities. Interesting news has popped up for this ‘lone wolf’ recently, particularly from Yasuyuki Oda who is the producer of the up and coming King of Fighters 14. The above quote certainly does imply that he wants to get a sequel out, and SNK have been mentioning since 2006 that the game has been (on and off) in production. Garou has recently been ported to iOS and Android by SNK Playmore, and was previously released on SEGA Dreamcast, PlayStation 2, and of course Neo Geo. If you think the Flappy Bird craze is over then think again, because there are two very interesting news items surrounding very interesting Flappy Bird ports for older systems. First off, YouTuber SethBling with help from YouTuber p4plus2 both managed to inject 331 bytes of code in to Super Mario World’s unused memory (which is basically a source code to Flappy Bird). The video above explains in detail how this was achieved, which is a world first for a human to achieve this code injection as it was first done a few years ago with assisted software. The process takes an hour to code manually and the full instructions are available in the video description in this Google Doc file. Pretty cool, right? Well, if you own a SEGA Dreamcast – and in particular a VMU memory card for the console, you can play Flappy Bird on that as well! Dreamcast Junkyard mentions not only the download links to the file but requirements to get this working. You need Dreamshell OS for Dreamcast and an SD Card reader on your system, the developer guacasaurus_mex also mentions that it doesn’t work as well with a VMU emulator, and strongly encourages play on the VMU to get the full experience. Wrapping up this week’s Retrospektive is news relating to the Contra series. A couple of years ago, Contra Evolution made its way to iOS and Android which disappeared sometime after 2013 from stores. Personally, I thought the game was not too bad – granted that it did push in-app purchasing a fair bit, but the game was still playable without having to pony up. Recently a trailer has appeared on Toucharcade for a new Contra game which is dubbed as ‘Contra Mobile’. The trailer and source indicates that the game is in fact a reboot of the 1987 release (which was also known as Gryzor in various regions), but there is no mention yet of when the game will be available, or whether it will be released outside of China.